Every person who has played Super Mario has probably dreamed about having real life versions of some of the items found in the game. What better item to have in real life than the coin block that spits out coins when hit from the bottom? I mean, come on, we could all use a few extra coins here and there. An Instructables member, who goes by name brunoip, has created a do-it-yourself Super Mario coin block and by golly, it works! The mp3 player gives you that oh-so-familiar sound that the box in the game makes when coins pop out. The other elements give you the possibility of gaining real coins when the box it tapped. Here is the block in action. You’re probably reeking with envy now – wanting your very own coin block. If you have the time and the skill, you can actually make one for yourself. 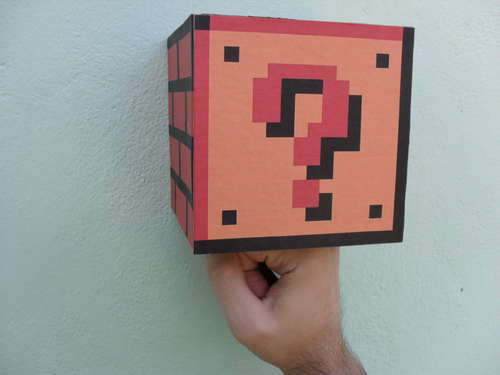 The brilliant Super Mario fan who is behind this project has provided all the information that is necessary to make a real life coin block. ((Instructables)) And if you’re just that good, then why not create more than one and give them away? I am pretty sure that this coin block can come in handy. You even get to choose what currency to use!